Promotion video for the Medals of the Beijing 2008 Olympic Games (the sound was very poor quality, so it was deleted). The medal design, medal box, ribbon and certificate were released simultaneously on 27 March 2007. The designs embody aesthetic taste of traditional Chinese culture and reflect the distinct Chinese characteristics and style. On the occasion of the 500-day countdown to the opening of the Beijing Olympic Games, the Organizing Committee for the Games of the XXIX Olympiad (BOCOG) unveiled the Games' medals. BOCOG Executive Vice-President and chairman of the evaluation panel Jiang Xiaoyu attended the unveiling ceremony and delivered a speech at the Capital Museum on Tuesday. 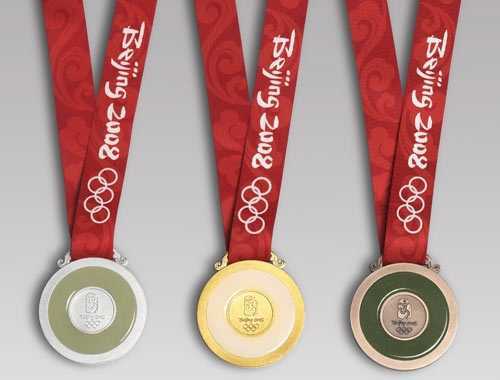 The IOC has strict stipulation on the Olympic medals' material, identification, weight, size and drawing. The medals for the champion and the runner-up are made of pure silver, and the champion's medal must be plated with gold weighing not less than six grams each. For the first time jade is used for the Olympic medals. The design not only meets the IOC requirements, but also expresses praise and honor that the Chinese people cherish for the Olympic Spirit and the Olympic athletes. 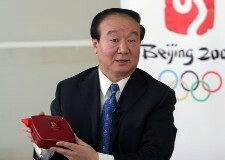 In his speech, Jiang Xiaoyu said the Beijing 2008 Games medals will be a major part of the Olympic legacy for China. 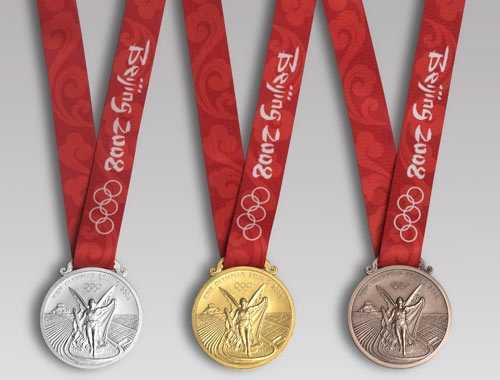 The design of the medals is a result of hard work and enthusiasm of many people. 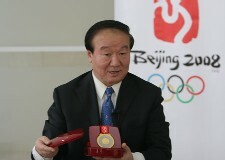 The medals, he said, embody strong Chinese style and elegant art, and are a harmonious combination of the Chinese culture with the Olympism, making them a vehicle to spread the Olympic Spirit and the concepts of the Beijing Games, as well as to showcase Chinese culture and arts, and the high levels of design and technology. The medal for the Beijing 2008 Olympic Games is designed with inspiration coming from "bi1", China's ancient jade piece inscribed with dragon pattern. The medals, made of gold and jade, symbolize nobility and virtue and are embodiment of traditional Chinese values of ethics and honor, sending forth strong Chinese flavor. The medals are 70mm in diameter and 6mm in thickness. On the back, the medal is inlaid with jade with the Beijing Games emblem engraved in the metal centerpiece. The design inspiration of the medal hook derives from jade "huang2", a ceremonial jade piece with decoration of double dragon pattern and "Pu", the reed mat pattern. Noble and elegant, the Beijing Olympic Games medal is a blending of traditional Chinese culture and the Olympism. It gives the winners of the Games great honor and acclamation as recognition of their achievement. On January 11, 2006, BOCOG launched a global campaign to solicit design proposals for the medals of the 2008 Games whilst inviting eleven professional organizations, including China Banknote Printing and Minting Corporation, the Central Academy of Fine Arts, and Academy of Arts & Design of Tsinghua University, to the campaign. The campaign was sponsored by BHP Billiton, the diversified minerals and medals sponsor of the Beijing 2008 Olympic Games and the Paralympic Games. Within three months, 265 entries were sent in from 25 provinces (municipalities, and autonomous regions) and Hong Kong Special Administration Region (SAR) of China, America, Australia, Russia and Germany. BOCOG called in a panel of experts and academies in the fields of arts, sculpture and mintage, thereafter, for two round selections of the 179 valid entries, and had the medal proposal improved during the process. BOCOG and IOC passed the final proposal on January 11, 2007 and February 8, 2007 respectively. The medal box for the Beijing 2008 Olympic Games is a wooden lacquer box made by traditional Chinese techniques. The box is rectangular in shape, with four slightly curving sides of its lid and base, a symbol of heaven and earth, which conveys the message of happiness and best wishes for the world. In the center of the lid is a golden inlaid Olympic emblem, splendidly in contrast with the red lacquer of the box. The medal ribbon for the Beijing 2008 Olympic Games is exquisitely designed with cloud pattern woven on the red strap, sending out joyful and festive atmosphere. The certificate is made of thin silk and rice paper, an integrated whole of traditional techniques and modern printing. 1- bi is a flat jade disc with a circular hole in the center. 2- huang is a semi circular jade ornament.